Long time no see, Cyril! SO. How about a written Q&A with the characters in the comments section? 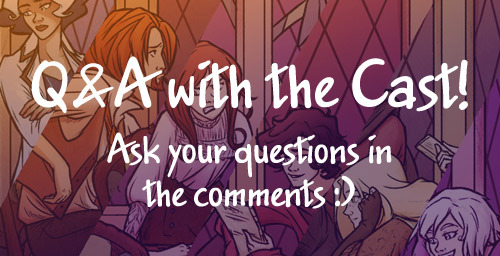 You can ask any questions you like to any character in Bookwyrms (or if you have any questions for me as well!) and they will answer. To the entire cast: Where’s the best place to hide in the library when playing a game of Hide ‘n’ Seek? ROGIER – That, my friend, is the toilets beyond the hemeroteque. ARABELIA – Not that I play that kind of game, but the best place to hide yourself or anything is the archives, underground. DYLION – I told Rogier it’s the toilets beyond the hemeroteque, but it’s actually the brooms closet next to the staff room in the first floor. HEDY – No place is safe in the Library to hide, as far as I know. KVELD – People play hide ‘n’ seek in the library? WITHOUT ME? But I have the best spot…! It’s behind the huge telescope in the observatory. That place hasn’t been cleaned in ages. But shhhh, it’s a secret. Thank you!! I had a lot of fun with this one, you may have noticed 😀 Actually… would you mind if I share a screenshot of it on twitter later? Hmm, maybe this is spoilery, but Rogier, what happened to your parents? ROGIER – Only thing I know is I was left in an orphanage. If they’re out there they don’t seem to worry about me, so I don’t worry about them. Aw that was a sad answer, but thanks Rogier! Hello! I’m new to your webcomic and read it all at once; I adore it! Your graphics are fantastic and I adore the different personalities of the characters. And might I say that their hair is on point! Anyway, I suppose I will ask a question or 2! 1. To the cast: What are your favorite pastimes? 2. To the author: Do you think you might publish this as a book when complete? It deserves more publicity; it is fantastic! ROGIER – Reading a good story. Or playing my little lyre. DYLION – Lying in the sun. HEDY – Researching about time. And as for the printing, that’s wonderful! I can’t wait! While I love the idea of suspense from the online version, I also would love to have a hard copy! Eek! So excited! I agree with the hair comment Sara! To all the cast again: What kind of music do you like to listen to? SUZZEN – I guess it’s no secret: Fire. ROGIER – I can’t think of anything, really. Death? DYLION – I’m afraid of dying, like everybody else. SUZZEN – Any calmed music, especially if it’s a piano. KVELD – Songs from my country. Usually telling stories about pirates, gods and mead. HEDY – I enjoy the Romantic-era composers. Arabelia levelled up her Relationships stat. Um, questions… Seems like all that comes to my mind are the stupid ones, but well – Suzzen! What’s the secret to maintaining those magnificent long hair of yours? Combing all that must take forever! I’m sorry this took so long to get answered, I had to deal with a huge issue yesterday (still unsolved actually) involving Bookwyrms being reposted without my permission in over 20 blogs and social networks (and apparently it’s in many more sites…). SUZZEN: …I don’t actually comb it? I mean, I make sure I untangle it when I shower, but then I leave it and it usually dries up outside in the wind. 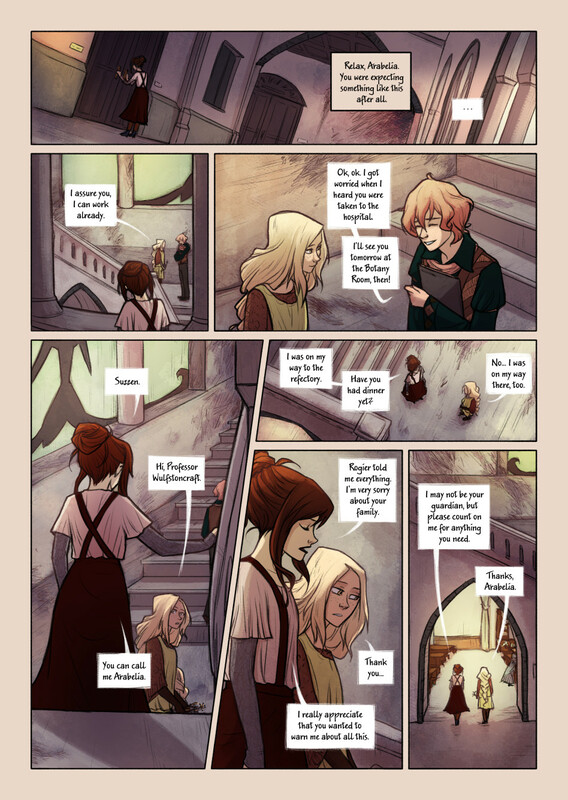 ARABELIA: Alyssa’s adventures in Aweland. It was awful, nothing made any sense. DYLION Bones of the Head, Part 2. HEDY Some collection of traditional tales for children. I remember a magic torch. KVELD From Sweven to the Moon! !